Along the Missouri River in North Kansas City. Spin your way to riches by playing the loosest slots around. We have over 1,500 of the hottest slots in several denominations, including all your favorite classic slots and the newest games in town! '37 Steak - Upscale Steakhouse - Not just a steak, an experience. 810 Sports Zone - Casual American - This sports bar and grill at Harrah's North Kansas City is the perfect place to catch a game and enjoy a delicious made-from-scratch menu. Roasted Coffeehouse - Quick Bites Cafe/Variety - Roasted Coffeehouse is proud to serve a medium-bodied blend custom-roasted exclusively for Harrah's North Kansas City by local favorite The Roasterie. 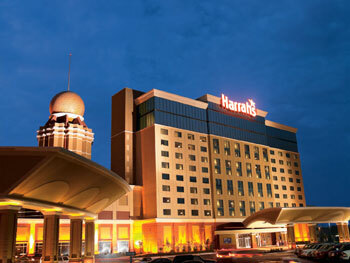 The Buffet at Harrah's - Casual Buffet - The Harrah's Kansas City buffet chefs will tempt your palate with an endless variety of delicious freshly prepared foods.